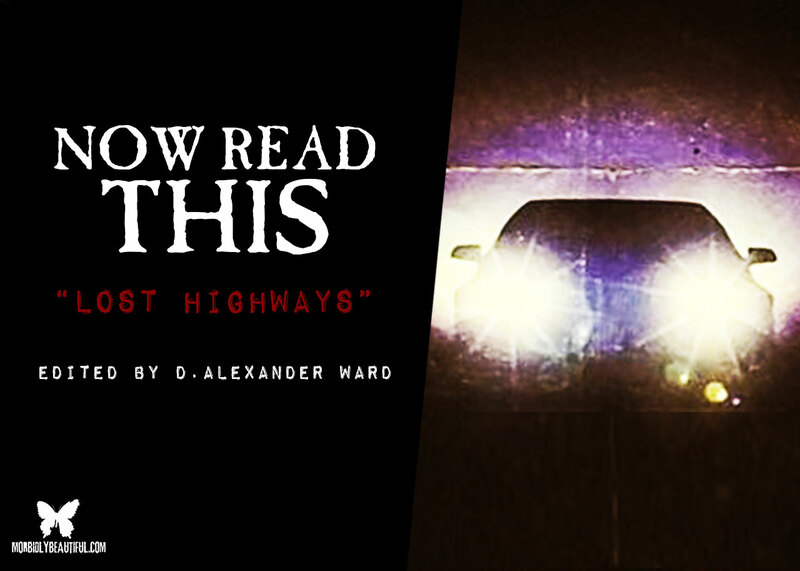 New anthology “Lost Highways” drives readers down that dark highway of supernatural horror, psychological intensity, and roadside menace. 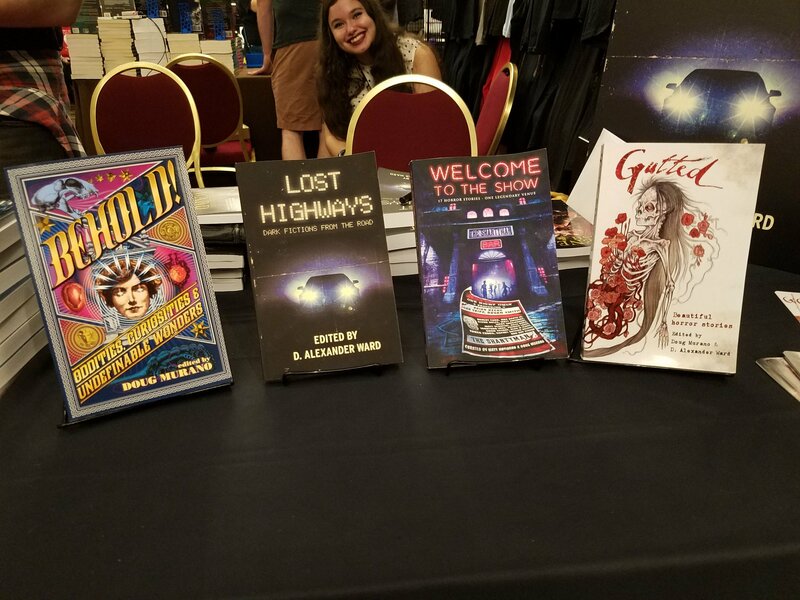 “Lost Highways” is the aptly-titled new anthology from Crystal Lake Publishing and edited by D. Alexander Ward. 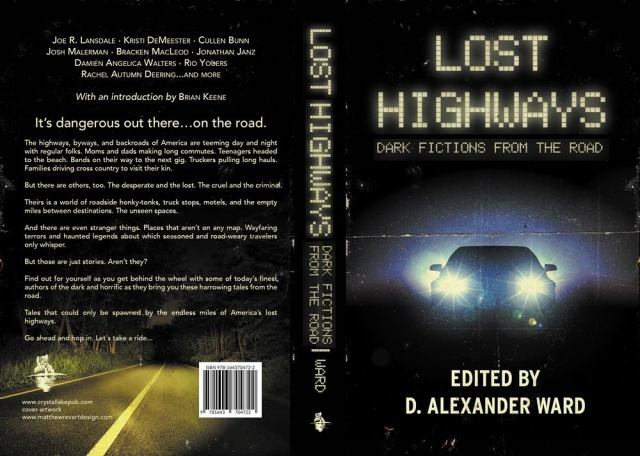 To great effect, this collection of short stories features characters “out on the road,” driving in their cars, stopping at roadside motels and diners, meeting ghostly hitchhikers and other sinister beings, and experiencing all sorts of terrors both human and paranormal. Not a single one of the twenty stories is a clunker; rather, they all captivate with believable characters, engaging plots, economic styles, and plenty of frightening and suspenseful moments. Here is a brief sampling of what this outstanding anthology has to offer the reader. Doungjai Gam and Ed Kurtz’s “Crossroads of Opportunity,” the story that opens the collection, tells the unsettling tale of a husband driving his “baby blue Buick” while his dead wife may very well be returning to life in the backseat; Matt Hayward’s “Where the Wild Winds Blow” follows Tony on a surreal, nightmarish motorcycle journey through a heavy fog that reveals deeply personal horrors; Joe R. Lansdale’s “Not From Detroit” is a darkly funny and tender-hearted story of an elderly couple who refuse to surrender to the rules of Death, while Lisa Kroger’s chilling “Swamp Dog” introduces readers to a mythical werewolf-like creature called a rougarou. My favorite story in the collection was Orrin Grey’s “No Exit,” a tale that uses the windswept landscape of western Kansas to spin a grim narrative about a murdered girl and a terrifying cult known as the Spiritus Aetum Sperarum. The climax of Grey’s disturbing story, which takes place at a rest stop with a history of blood-soaked violence, includes elements of the supernatural — and yet the human experience in the finale packs a jarring and emotional punch. The characters in the next story, Kelli Owen’s “Jim’s Meat,” are forced to endure a cult of sorts as well, this one in the form of a horde of roadside attackers in an isolated town. A playful word of warning — the ending of Owen’s story might make you never want to eat any kind of “local meat” again. Bracken MacLeod, the author of “Stranded” and “13 Views of the Suicide Woods”, penned the next story in the anthology, “Back Seat,” an unnerving look into the bond between a father and his daughter, the lengths people will go to in order to survive desperate times, and the ugly reality of parental neglect. MacLeod’s is an eerie, tragic story made all the more effective by its small suggestion of hope and optimism at the very end. Elsewhere in “Lost Highways” comes Jess Landry’s “The Heart Stops at the End of Laurel Lane,” which showcases a mother frantically trying to stop her daughter from making a harrowing decision; and Nick Kolakowski’s “Your Pound of Flesh,” one of the collection’s more psychological tales that will have readers second-guessing the intentions of the protagonist. All of the stories in “Lost Highways”, including the ones not mentioned here, are outstanding — well-written, off-beat, at times humorous and at times horrific. The overarching theme of the anthology works well, providing the authors the opportunity to create memorable characters and settings. Released by Crystal Lake Publishing, “Lost Highways” is now available as both a paperback and e-book.